Hannah McGregor’s research and teaching focuses on the histories and futures of print culture and new media in Canada, with a focus on Canadian middlebrow magazines, and podcasting as both self-publishing and public pedagogy. 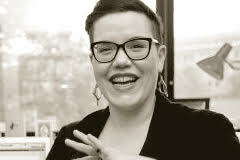 Hannah completed her PhD at TransCanada Institute at the University of Guelph in 2013, where her research looked at twenty-first century middlebrow publishing in Canada. Her SSHRC postdoctoral project, “Modern Magazines Project Canada,” was completed at the University of Alberta. In collaboration with the University of Alberta Libraries and the Manitoba Legislative Library, it helped to facilitate the digitization of the full run of the Winnipeg-based magazine The Western Home Monthly (1899-1932). Hannah’s current research takes advantage of this digitization to explore digital methods for the study of periodicals including topic modeling with MALLET, visualization with R, and interactive timelines. A co-authored chapter on this work is forthcoming in Reading Modernism with Machines (Palgrave Macmillan 2016). With Paul Hjartarson and Faye Hammill, she also secured a SSHRC Connection grant for “Magazines and/as Media: Methodological Challenges in Periodical Studies,” a workshop that included international scholars, librarians and digitization specialists, and local magazine writers and editors in discussions of the intersections of periodical publishing and digital culture. The papers from this workshop are published in joint special issues of the Journal of Modern Periodical Studies 6.2 and English Studies in Canada 41.1. A secondary area of research is the intersection of feminism and new media, particularly the challenges facing women in digital spaces. With collaborators Marcelle Kosman and Clare Mulcahy, Hannah is co-editing a special issue of the journal Atlantis on women activists, artists, and intellectuals negotiating the fraught affordances of various digital publics. Hannah and Marcelle also make Witch, Please, a fortnightly podcast about the Harry Potter world. They have spoken about their public pedagogy and fandom in a variety of venues, including the feminist journal Ravishly, CBC Edmonton AM, the Edmonton Journal, and at various fan and entertainment expos around Canada. Hannah currently teaches PUB 101 (The Publication of Self in Everyday Life), PUB 401 (Technology and the Evolving Book), and PUB 801 (History of Publishing). For more details about her publications, awards, and teaching experience, see hannahmcgregor.com. She can also be reached on Twitter @hkpmcgregor.